Indira has had three litters. As soon as she weans her last litter and is spay she will be placed in her forever home. Hoshi has been placed near my home. It will be good to get to see her once in awhile. Gracie had one litter with a total outcross for my cattery. I found Gracie an excellent pet home and she will enjoy her pet life. BeeBee had one litter and was then spay and placed as a pet. The only surviving kitten was placed in a pet home. The Lines were found to have flat chest defect that caused the kittens to die. BeeBee was also the only survivor of her siblings. Felicia has been a delight to have in my home and cattery. Very outgoing and loving. Felicia had one litter and needed a C-section. I decided not to put her through another litter. Felicia has been adopted by a friend and will live the life of luxury. Buzet was a real joy to have in my home. Very sweet and VERY loving. Buzet could never get enough attention. I tried a number of times to mate her, but it never took. So, she was spay and will be going to her new home soon. Catniss was a real joy to have in my life and home. She was a very good mother and purred all the time! Catniss has gone to her new home and family. The couple came to my home and knew immediately they wanted her. She expressed her love of them too by going from one lap to the other. Tiara (nickname of Ti ; pronounced Tea) had difficulty with carrying her kittens to term, and when she did she had to have a C-section each time. The first and second C-sections all the kittens died. The 3rd and final C-section, Ti had many complications, thus was spay at the time of C-section. From that litter she had only one kitten that lived. I will keep that kitten to test out if the difficulties were genetic or possibly just congenital. Ti was a beautiful girl that did not like to go to shows. She would bite at the judges when put back into a cage. I was fortunate enough to make her a Grand Champion. She will go to a new home when her kitten is weaned. Like her mother, Winter, Allie became a model for advertising agencies. She enjoyed being shown at the cat shows but wanted to be a mother. So Allie was a mother for a couple of litters. I have been fortunate enough to get a kitten from her to show and breed to futher her lines. Sweet, sweet Allie is in a pet home in Kansas City with one of her kittens from her first litter. Winter is an amazing cat. In addition to being a show cat, she was a wonderful mother. Plus, she was a model for a number of advertising agencies. One photographer kept calling for Winter. "Bring me Winter, Bring me Winter !" It was a thrill to see a person who isn't a judge at a cat show appreciate the EYES of a cat. He was totally enthralled with Winter's eyes. After her last litter, Winter was spay and adopted by a very nice couple I have known for a number of years. Origami had an injured left eye that kept her from being shown. But a beautiful girl! She had one litter and then spay. I am so lucky that a friend wanted to adopt her. Origami is an amazing loving kitty. Dreamer was sent to another breeder to show and then use as a breeder. Since I did not get any kitten back from the breeder, she offered to send her back to me. I wanted to preserve the bloodlines, and accepted Dreamer back. She had this one litter and then was spay and petted out to a person who had been waiting for her. Dreamer is being loved and cared for by one of my friends. 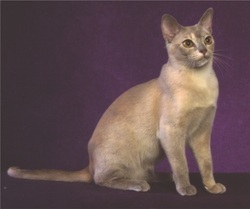 Be-A-Trix was the second Brown European Burmese in the USA to become a Grand Champion. Her Grandfather (Asher) was the first. Be-A-Trix is a very loving girl that was spay and placed during our time of downsizing to move. She had difficulty adjusting to the move and had to be rehomed. Be-A-Trix is now happy in her new home and the person in Bea's life is so much in love with this very personable kitty. Hoda was born during the time we were building our home in the country. Since we had to downsize for the move and to sale our home, she was spay and placed in a very loving home. The family has now had a baby and after Hoda has been the baby in the family for awhile, I wondered how she would handle the new buddle of joy. Hoda was introduced to the baby without any problems ! Patzy was born during a time we were building our home in the country. Due to needing to downsize in order to sale our home in the City, we spay her and placed her in a pet home. She is living in the lap of luxury ! Ashley became a Champion and then became more interested in becoming a mother. So she had one litter from which I kept a kitten. She was spay and placed in a very loving home. Tali grew into a beautiful girl but wanted to have babies. So she became a Grand Champion and then had a litter of kittens. She was placed in a loving home and continues to bring joy to the family. 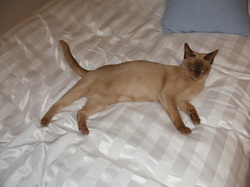 Mona went to another European Burmese Breeder and resided in their home. She had several litters and when it was time to let her go, I asked if I could have her back to have one litter. I needed to get a kitten from those lines. Due to difficulties with Mallory's litter, I was unable to keep a kitten. So, Mona returned to me. She will be having a litter soon. After which I will retire her and plan to keep her in my home. From the moment Mallory was born, I could tell she was very special. She was the first out of the birthing box. She was the first to eat kitten food. And the first to use the litter box. By just looking at this picture, you can tell how "alert" she is to all that is going on around her. She was easily trained to do tricks and thrives on showing off. Mallory was shown to Championship status and then used a couple of times as a breeder. When spay, she had a home waiting for her. She lives with a wonderful family who enjoys teaching her clicker training tricks. Hope was a cat I named to carry on a line that I didn't want to loose. She was my "Hope" ! She was allowed to have one litter and I kept a kitten. Hope was then placed in a home in Colorado where she lives her life with a family who has other cats and a dog. Once in a while I see hope at a few Colorado shows and it always brings a smile to my face to see her. Paige lived with me for over a year, went to shows and became a Champion. Since she wanted to have babies, I kept her home and she had two litters. Paige being the wonderful girl she is, I placed her with a family that also adopted one of my kittens. With some clicker training, they live together in harmony in Kansas City . Quin was such an amazing beauty ! Her coat was the coat color I look for in the lilacs. Light dove gray on top with a hew of pink. So beautiful. Quin was an excellent mother & I was able to keep one of her kittens to further the lines. Dita was made a Grand Champion and retired from the show ring. She became a mother shortly after and had only one litter and was spay. She now lives in Nebraska as a beloved pet. Lollypop remains in my home as my pet. When I held her as a kitten, I told her "you're just as sweet as apple pie". Then I remembered that was a line in a song. You guessed it ! The song was "Lollypop". I showed Lollypop as a kitten, adult, and a spay. Lollypop never had kittens. When it was time to think about letting her go to a different home, I vet said that Lollypop was really bonded to me. He said in the vet's office her eyes never strayed from looking at me. So, she remains in my home as one of my sweet girls that I love on everyday. Likie did not meet my standard for a show cat, but her pedigree was one that I wanted to preserve. Once old enough she was mated and had one litter. A kitten was kept from the litter. Likie was spay and placed in a home near Wichita, KS. She continues to live a wonderful pet life. Bindi did not like going to shows, so she never went to a show. She had one litter and then was petted out to a loving home. After MeMe retired from show and having kittens, she retired to my home as a pet. The first time I saw Meme as a kitten, I said "ME-OH-MY-OH" and that became her name. Aditi had one litter and then spay. She was small in size and I didn't want to stress her body in having any more kittens. She was placed in a loving home and is pampered every day. As you can see, Gucci was afraid to be at the show. She wasn't a show cat so she stayed home. I finally decided to spay and let her go to a home with her brother. Irmy's eye color did not come in as well as I thought it should. So she was spay and sold as a pet that could be shown in Premiership. Irmy was very loved ! Kifujin had one litter and then was spay and petted out. She is a very sweet girl that has made a family very happy. There is a saying to watch what you call someone, for they may just end up that way. Witchy was true to her name. She picked fights with all the other females in the house. So she was allowed to have one litter and then was spay and petted out. The personality was not what I wanted in my lines, so I did not keep any kitten for my breeding program. As an only pet in the house, she is a delight for the family who adopted her. I will never forget Gina. It was a huge loss for my cattery. She went into the vet's office for a C-Section. She came out of anesthesia without any problems. Five minutes later she had died. They revived her, but she had severe brain damage. After several weeks of hoping she would come out of the "mental hell she was living" I had her put to sleep. Such a wonderful sweet girl. My heart still aches from the loss. ExSea came from Australia (across the seas and oceans). Because she would never travel back across the ocean and seas, her call name became Ex-Sea. I took her out as a Kitten, Adult, and ran her for a breed win in Premiership. ExSea had several litters and was spay. After the veterinarian saw how bonded ExSea was with me, he said that she needed to stay with me. So ExSea remained with me as one of my pets. Bliss had one litter then was spay. She went to a very loving home. Pearl was very special to me ! Such a wonderful personality and loving cat. She came to me from my mentors in the Netherlands. And she produced wonderful show cats. Pearl was very very smart and could open doors, drawers, and cupboards. I never knew what I would find out in the middle of the living room. After her show carrier and having kittens, she was spay and placed with a dear friend. Emrha'ah lived with Penny Hardy in Colorado (Yaramaz Cattery). After being a show cat, she was bred and had a couple litters of kittens. Penny kept a kitten from one of the litters and then spay and petted out Emrha'ah to a good home. Passion did not like going to the shows. She knew she was very pretty and did not have to prove it to herself or to me. So after this one professional picture Passion stayed home. Passion had one litter and then was spay. She didn't really care to be a mother and would leave her kittens to another mother to care for. What a pistol ! She was spay and placed in a home. The family has been very happy with her and brag about all the tricks she knows. Tipper was a wonderful mother to her babies and with the other mother's babies. When ever she or any other female was about to give birth, Tipper would scream at me to tell me the birthing was about to take place. That was the only time she really talked much. Tipper had three litters and then was petted out to a friend of mine. I still get to see Tipper and enjoy her endearing personality. After Retirement, Lovisa became one of my pets. She lived with me up until her recent death. I was so fortunate to have had her and taken her all over the country for a Breed and Regional Win. She was a wonderful travel partner. Lovisa had one litter. One of her male kittens were shipped to Europe as a show/breeder. The other kitten was adopted by a young lady who showed him in premiership. Coco had two litters, spay and placed as a pet. Sumi had three litters , spay, and kept as a pet.